Asthma can be a rough deal for persons of any age. So if you’re a little kid who is scared and nervous about not being able to breathe right, it really helps to have a friend on your side. It really helps when that “friend” works just as well to control and regulate asthma symptoms as “big people” inhalers. Yes, the Margo Moo Steam Inhaler may look like a child’s plaything, but it is anything but. Margo Moo doesn’t even quit with treating allergies. This steam inhaler provides a fast 6 to 9 minute treatment that can relieve symptoms of allergies, bronchitis, colds, laryngitis, flu and just plain dry throat from forced air heating or other household irritants that lead to breathing difficulties. Margo Moo is a safe, effective natural therapy for all these symptoms. Of course our little friend Margo Moo was created just for kids. But hey, if you suffer from any of the conditions known to affect your breathing and want a little fun in your treatment, this inhaler could work for you, too. The soft, flexible mask fits little faces better, of course. You can adjust the rate of steam treatment that reaches deep down into bronchial passages with soothing, relaxing, gentle moisture. Just fill the Margo Moo with the measuring cup provide, put the mask on with a non-threatening elastic string and your little patient is ready to go. There’s even an aromatherapy tank, and not because Margo smells like a real cow. 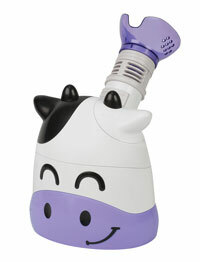 Instead you can use the Margo Moo to induce a relaxed mood with a comfortable, familiar aroma chosen by your child. The great thing about products like the Margo Moo Steam Inhaler is the familiarity and non-medical looking structure. Margo can help any nervous patient have a better experience treating breathing problems. At only $49.95 it comes with a Price Protection Guarantee that says if you find the Margo Moo Steam Inhaler for less anywhere else, you can get a refund of the difference in price from Allergy Asthma Technology. That’s a pretty assuring deal, all around.